For the next few days, let's journey with Joseph and Mary as they experience the incredible grace of God. 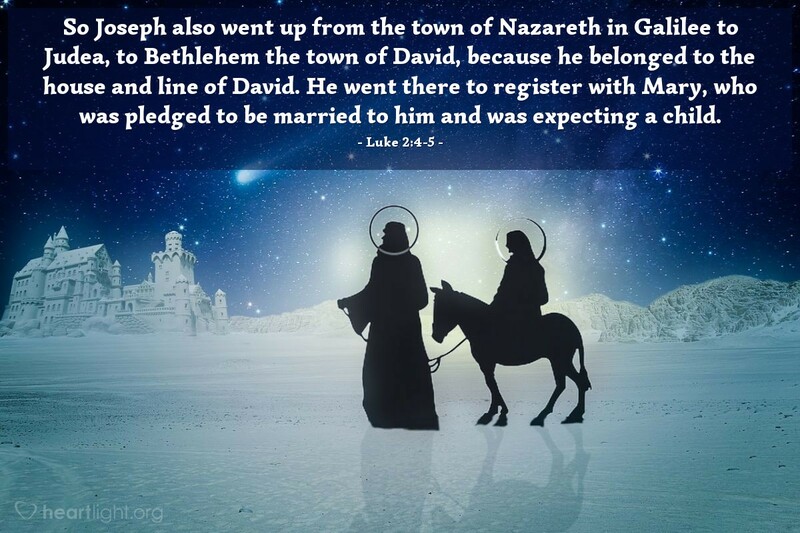 These verses give us the basics: they took a trip south from their home, they went to Bethlehem which was King David's city, they were "betrothed" or pledged in marriage but not yet fully married, Mary was pregnant, and they were going there to register with the Roman government. Intrigue and scandal ripple between the lines of this straightforward account. Promise and fulfillment are strongly suggested with the connection. Faithfulness through the midst of storm is demonstrated. A real historical context for everyday people is made with the presence of a Roman census. Scandal, promise, faithfulness, and history collide. Jesus enters our world very much in a place where we find ourselves — a place of hope and dreams marred by scandal and disappointment. He will be a people's Messiah. We know it before he is even born. It makes us love him and appreciate him more. God has chosen to enter our world as one of us, not as some pristine and untouched alien from beyond. This is a Messiah we can reach and follow. This Jesus is one of us. Holy and loving God, thank you for the gift of Jesus. Thank you that he entered our messy world with all its contradictions, ironies, and conflicts. Thank you for not being aloof or immune to our struggles. Thank you for Jesus, in whose name I pray. Amen.